On Sundays the Cat club has started again this runs for another 9 weeks. Advanced sessions in the morning 10:00am – 13:00pm and Beginner sessions in the afternoon 14:00pm – 17:00pm £20 per person and please email sailing if you wish to attend. We look forward to seeing you all at the club soon from all the team at Datchet Water Sailing Club. Last weekend saw two Datchet Wayfarers in attendance at the championships, on Saturday and Sunday. Unusually for a championships PYC opted for a round the cans racing using standard club racing sailing instructions on the Saturday and on the Sunday racing was part of Poole week sailing instructions, on both days default courses were set for the second race of the day with a typical Triangle and Sausage configuration. All races took place in the harbor with the usual difficulty in finding marks, and dealing with tides, and negotiating bay traffic. Saturday was forecast for light winds but we were blessed with sun and a steady for force 3 ish. On Sunday we woke to find torrential rain, but once again the sun came out to play but with some very lively wind conditions. 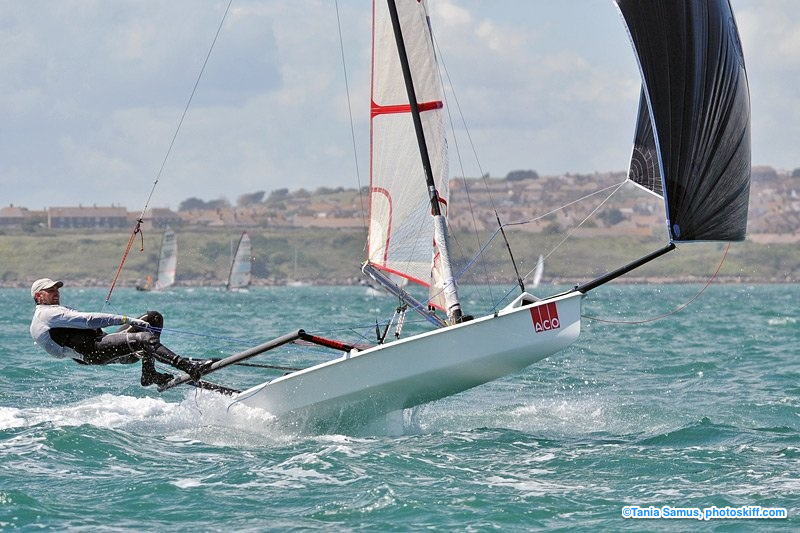 The weekend provided interesting and challenging sailing with varied conditions and with the usual Parkstone Y. C hospitality , the weekend could only be described as brilliant. Derek Lambert who I have to thank for his navigation skills. In 3rd place was Martin Collens in Pieces of Eight. Well done Andrew and Tom & Tony and Dereck ! Notice to all club members regarding SUP Armada this weekend. Just a quick reminder about the SUP Armada. If you are planning to make the most of the wind on Saturday, you will be required to launch from either the north or south slipways as there will be no launching from the beach. You will be asked to sail up the very far end of the reservoir to accommodate the Guinness World Record attempt. Please note, there will be no day sailing tickets issued that day. The information contained in this message or any of its attachments is confidential and may be privileged. Unauthorised disclosure, copying or dissemination of the contents is strictly prohibited. The views expressed may not be official policy, but the personal views of the originator. If you are not the intended recipient or have received this message in error, please delete this e-mail and advise the sender by using the reply facility in your e-mail software. All messages sent and received by DWSC are monitored for viruses, high-risk file extensions, and inappropriate content. The registered office address of Datchet Water Sailing Club is Queen Mother Reservoir, Horton Road, Horton, Slough, Berkshire SL3 9NT. Please visit our website at https://www.dwsc.co.uk for further information about DWSC. The SUP ARMADA at Datchet Water Sailing Club This Saturday. Come and join the fun and maybe leave a world record holder. 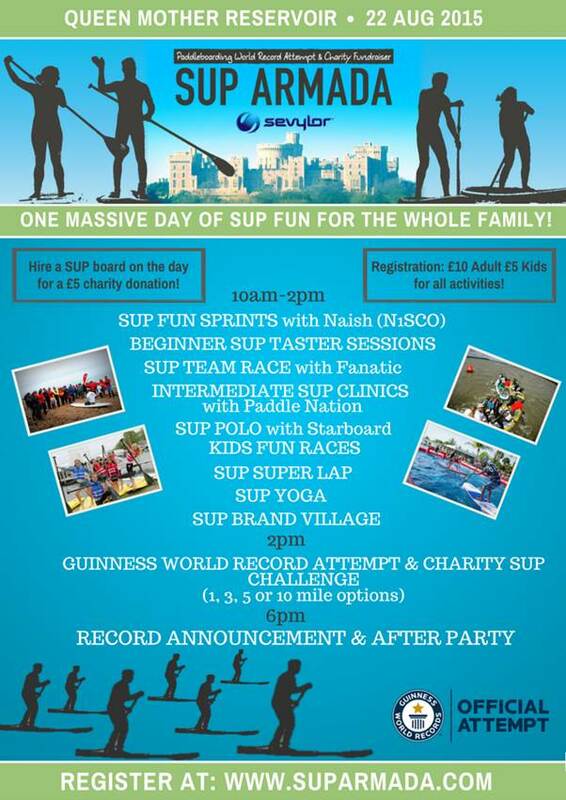 We’d love all Datchet Water Sailing Club members to join the SUP Armada for great day out on the water, loads of fun SUP activities for everyone to try and an attempt to break a SUP Guinness World Record. Taster sessions will also be available, so even if you have never been on a SUP board before, you can come down, join a taster session and potentially leave a World Record holder! Tickets are only £10 per adult/ £5 per child for the whole day – you can register online at www.suparmada.com or sign up on the day. We hope to see you on Saturday! Bart’s Bash is on Sunday 20th September. This year DWSC will make it the first race of our Club Championships, which is the event where club members compete on a handicap basis for the coveted Club Champion trophy. In addition to the Bart’s Bash race there will be three other races offering a variety of courses to try to even up everyone’s chances. Non-members are welcome to join us for Bart’s Bash. Please ask the office for details. For details of entering the Bart’s Bash race please go to http://www.bartsbash.com/. Thank you to all who have completed the survey. It is only open for a few more days so please let us know what you think. Great fun last night. Vice Commodore saved the general manager because safety coxswain too busy laughing to assist. Meeting at the club for 6pm on Thursday next. Wednesday 26th August Evening Racing! The setting sun series finishes on the 19th August and we have our final fun race on the 26th August at 7pm. To finish this year’s Wednesday series on a high, Keith has agreed to put on a BBQ whilst we are having prize giving. The cost for the BBQ is £10 per head which will include a burger, piece of chicken, sausage and a beer (or soft drink). So that Keith can cater for us, he needs to know numbers in advance. There is a booking sheet with Keith for you to confirm your attendance and you will need to pay in advance. Booking will close on the 19th August. Please could we all try to make the 26th a well-attended success. For those of you that have been racing on a Wednesday, thank you for taking part and I hope that you have had fun. A special thank you goes to all of you that have given up a week to be the race officer, and to Gavin who has volunteered to cover safety each week. Without the race officers and safety, we would have all missed out. For those of you that have not tried Wednesday racing, why not join us for the fun race and get the bug for next year! The Musto Skiff Datchet Water Sailing Club Open is on the 29th and 30th of August. The sailing instructions will follow soon. Calling all windsurfers – this Thursday the 13th August will be the launch of Thursday evening windsurfing for the next 6 weeks from 6pm onwards. We have installed some additional matting for rigging on the beach and mats into the water, a leader board has been erected in the club house and GPS will be available to record your speed. Everyone is welcome to take part and some friendly tips and advise on how to improve your technique out on the water will be available. There will also be SUP’s (Stand Up Paddle Boards) to use along with an instructor on the evening so bring along the kids for a really fun Thursday evening of windsurfing and socialising. BYO drinks for a social beer or two after the sailing, we will be ordering in fish & chips for supper £5 per head.